Since teaching a lesson on compassion for my ladies bible study this past week, the subject has been weighing heavy on my heart. The area bothering me is not compassion for the lost, the sick or the poor, but compassion for the lonely, isolated and hurting within the church walls. Last night I attended an event with my twenty year old son who is lonely, hurting and hiding. There were many present from the college group at church, most of whom had no idea who my son was. The host was very gracious and engaged my son in conversation a couple times. However, no one else noticed that there was a stranger in their midst. Or if they did, they did not bother to leave their group of friends to introduce themselves or try to include him. This was the same lack of reaction he received when he attended the college group at church a few times. Before you get me wrong, let me clarify myself. Most of the blame lies with my son. In his insecurities and preconceived notions about ‘Christians’ he has isolated himself and does not give out good vibes. Yet it is often these people that need the church to reach out to the most. This isn’t only true of young people. What about the person on Sunday morning who arrives alone in their car, walks in alone, sits by themselves, receives a ‘good morning’ with their bulletin and a handshake during welcome time, but no other one on one interaction. They leave as lonely as they arrived. Or what about the individual who arrives looking like they came from the wrong side of the tracks, or whose sexual orientation is in question. The definition of compassion is ‘a feeling of deep sympathy and sorrow for another who is stricken by misfortune, accompanied by a strong desire to alleviate the suffering.’ So feeling sorry for someone is not the same as showing compassion. We may feel bad for someone because they don’t have any friends but if we aren’t willing to be that friend we are not compassionate. The reality is, only a small percentage of people are popular and that is alright. Most people only need one or two friends. But they do need Christians to be friendly, supportive and compassionate. Sadly the church often resembles the world when it comes to clicks and selfishness. What weighs on my heart this morning is that I am guilty of the same. I notice ladies arrive alone at bible study yet often do not seek them out. These are often the women who leave as soon as study is over, often noticing the groupings of ladies discussing where they will go to lunch. Do they yearn to be invited? On Sunday mornings I seek out my life group instead of those either new or avoided by others. I am guilty of ignoring the people I don’t want to get caught up in conversation with. The tune and lyrics of “Let there be peace on earth and let it begin with me…” are playing through my subconscious as I write. I can’t change how others think or act but I can change myself. My heart is softly crying for the hurting individuals who dare to enter our church walls, needing not only a word from God but a touch from his people. “For whatever you do to the least of these, you do unto me.” That means that every lonely, unconnected person at church tomorrow should be ‘Jesus’ to me. So I pray that God will lay on my heart who He wants me to touch and take away any selfishness, fear or insecurities, so that I will reach out. Let there be change in the church and let it begin with me. Give me a heart of compassion for the ‘alone’. This entry was posted in church, compassion, lonliness. Bookmark the permalink. >Thanks for stopping by Live and Learn. I enjoy blogging but I have also met some wonderful friends online that are great to share thoughts, ideas and life with.My son is graduating high school and has never gotten connected with the church youth group. I have spent much time praying on what I should do, what he could do. He leaves for college in the fall and my prayer has turned to, "Let someone who understands him invite him to church. Let him find a place to worship." That's all I have, but until my son is strong in his own personal relationship with Christ I try to teach him that all Christians are hurting, crippled and trying to find their way in the dark. Some are spiritually mature enough to reach out beyond themselves, but many are not. I look forward to reading more. Grace and peace. Thank you for your honesty. 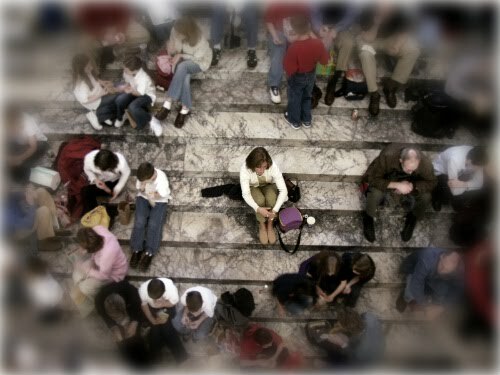 The subject of lonely people, especially within the church has been on my heart for years. I can relate from many viewpoints …from other adults stories, from kids feeling like outcasts, from the homeless, from those outside of the in crowd or a small group. Whatever the case, there are far more people walking in and out of church who feel alone than most of us will ever know. It is very sad and on various levels we all feed into it. >This is the best of your writing yet. Beautiful, and full of honest heartfelt concern. I know God will use you to minister to the lonely. Truthfully, He already is.